Located just inside Malaysia in Perlis state on the border with Thailand, lies the KTMB Padang Besar Train Station (Stesen Keretapi Padang Besar). Here, is where you will go through immigration (or cross over by the main land border just over the railway tracks) and now all KTM trains terminate here, with SRT trains taking you on the journey into Thailand. Just across the border, is another Padang Besar Station in Thailand. 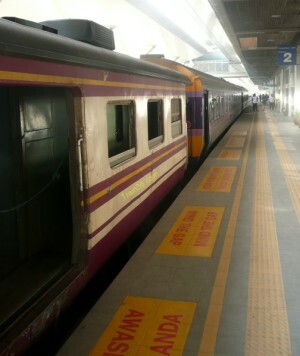 This small stop is used by locals on the Shuttle trains as well as the International Express that stops here just before crossing into Malaysia. The new ETS high-speed trains have now started operating out of Padang Besar Station. New Shuttle Train from Padang Besar to Hat Yai. As of the 22nd December 2015, there is a new shuttle train from Hat Yai to Padang Besar border station, operating twice a day in either direction. New Komuter Train from Padang Besar to Butterworth Penang. From 1st January 2016, there is a new KTM Komuter Train from Padang Besar to Butterworth - stopping at all stations in between. Please Note : All old KTM diesel trains have now been cancelled and replaced by the new fast ETS Trains or Komuter Trains. Also : The International Express no longer travels into Malaysia and now terminates / originates from Padang Besar. Trains coming from Malaysia will usually come into the station on the Western platform and the Malaysian immigration booths are at the Southern end of the platform (just follow the signs). Once you have your passport stamped out of Malaysia, turn left and get stamped into Thailand at the Thai immigration. If you need to buy a ticket from Padang Besar to Hat Yai or beyond, you will have to go into the Thai railways office at the Northern end of the station. Coming from Thailand you will have to go through the immigration process and your bags will usually be checked by Malaysian customs officers just after being stamped into Malaysia. Trains coming from Thailand come into the station on the Eastern platform with the Thai immigration booths on the Northern end of the station building. If you have to pay an overstay fine on your visa, don't stand in line with everyone else, just go up to one of the Thai immigration officers who can be found outside the booths and tell them "overstay" and you will be directed to an office at the back to pay your fine. After that, you have to join the queue with the rest of the passengers and get stamped out of Thailand. If you want to buy KTM tickets for travel inside Malaysia, the KTM Tickets Office is located upstairs. I would however advise you to just change up enough money to get you to where you are going and change more money when there is more competition around, so you can bargain for a better exchange rate. If you go upstairs, there is a canteen where you can get breakfast if you are crossing on one of the morning trains. Food is mainly Malaysian pre-cooked "Nasi Kandar" style and pretty good and reasonably priced. You can also buy snacks, cold drinks and get your morning coffee or tea here. Just make sure you don't miss your train. They will accept both Thai and Malaysian currency as payment. If you are crossing on one of the evening trains, the canteen is usually closed, but often they sell drinks and snacks from the station platform. Other facilities include toilets with wash basins and a very small duty free shop which seems to sell only a couple of products. The Padang Besar train station is actually located within Malaysia in the state of Perlis. So, if you are on a train from Malaysia to Thailand and had not gone through passport control yet, you could skip getting your passport stamped here and go upstairs where there is walkway over the tracks to the main land border crossing at Padang Besar. 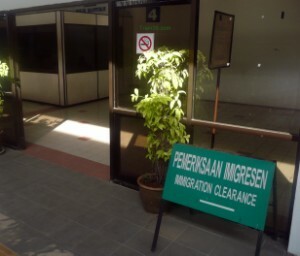 Once you have crossed the tracks, the Malaysian immigration is just a one minute walk to your left. It is then a five minute walk uphill to the Thai immigration (passing a big duty free shop as you go). Once you are out of the immigration area and onto the main road, there is a bus stop on your right across the road where you can get a bus to Hat Yai. This bus service stops at Hat Yai bus station along its route and costs around 50 Baht. 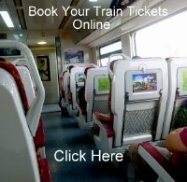 If you are not planning on staying in Hat Yai, this can be a better and cheaper option than the train, as the bus station is around 5km away from the railway station in Hat Yai. 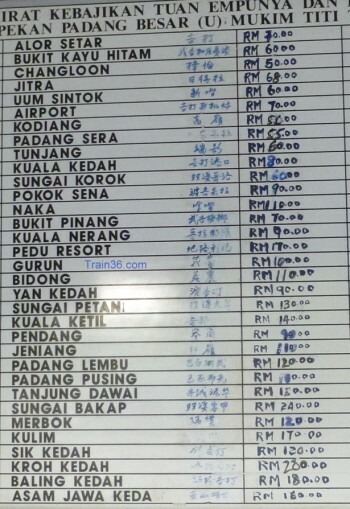 If you want to stay in Padang Besar for the night for some reason (not much there!) you will find plenty of cheap hotels on the Thai side of the border in the centre of town and one guesthouse on the Malaysian side (in the first block of buildings as you walk down from the border area). In Thailand, prices start at around 250 Baht for a fan room (JJ Hotel) and most places have their rates posted on the front of the hotel in Malaysian Ringgit ($). If you are coming from Thailand on train number 35 and going to Arau for connections to the ferry to Langkawi, you could also use this bridge to the land border (once having your passport stamped into Malaysia) and catch a "Mara Liner" bus to Kangar, then another Mara Liner bus from Kangar to Kuala Perlis port. This will save you having to get a taxi from Arau and the two buses should cost less than 8 Ringgit in total. It will take longer, but will save you money, especially if travelling alone. There is a bus to Kangar that stops just south of the roundabout (don't go to the bus station, it is no longer in use). 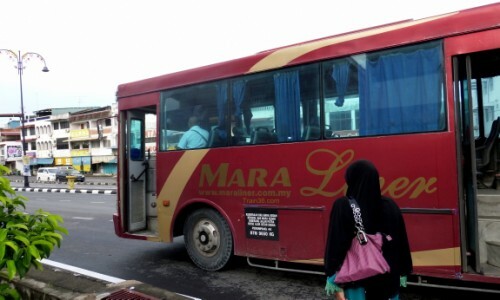 From Kangar you can then change to another bus for the port of Kuala Perlis, for the ferry to Langkawi. Alternatively you could get a taxi from Padang Besar Malaysia. 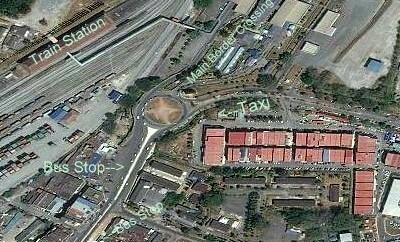 The long distance taxi office is located about 50 metres away from the roundabout when you come out of the main land border immigration area, on the left. These prices are from 2014, so use as a guide only as they may have changed.